This one would be high gloss black with the addition of brushed aluminum. Aluminum plate would be milled and wrapped from top to front. The design is a streamlined approach. To me it looks like something Tt would produce possibly. The ribs remind me of valve covers from some old muscle cars and so I thought it could tie into the &#34;GT&#34; in some strange way. The aluminum gives it that mechanical feel and looks awesome with black! The door would be made from .250 acrylic that is tinted enough to be black when powered off but will show off the insides when the lights are kicked on. I would make the door frame from aluminum plate and give it the brushed treatment as well. Taking everything off the side and creating one huge swinging door is a good design idea. I doubt that you'd have much problem with the hinge area, they seem strong enough in the pictures I've seen. Dark acrylic looks great with lights behind it too. 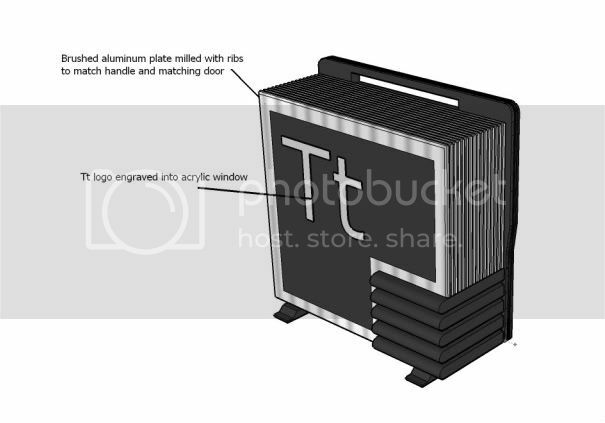 As an idea, instead of engraving the logo, you could make it out of aluminum too, and then embed it in the plastic or glue/mount it somehow.